Do you really want to find lost stranger which you have met on Omegle? So We recommend you to take a look at our example form here. It will guide you about how to fill form and it will show you which sections are required or not. We recommend you to write a good title and description of conversation for find the stranger. Adding ASL with cities (If you have told to Stranger) will be also very good info. 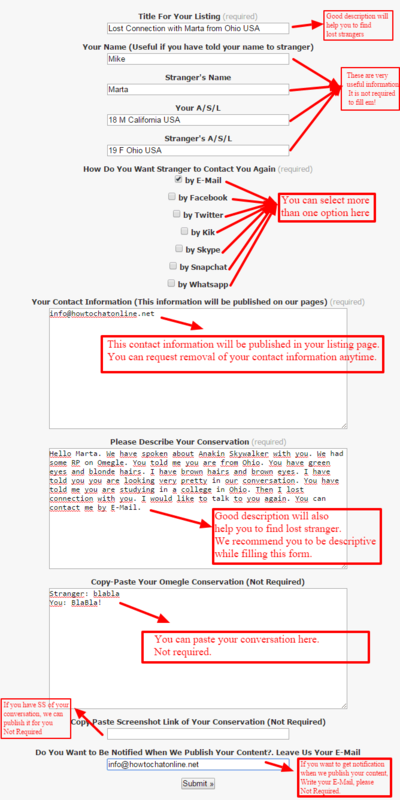 You can take a look at picture below to understand how to fill the form. You can click on picture to enlarge and see texts clear. Description of Omegle Conversation Hello Marta. We have spoken about Anakin Skywalker with you. We had some RP on Omegle. You told me you are from Ohio. You have green eyes and blonde hairs. I have brown hairs and brown eyes. I have told you you are looking very pretty in our conversation. You have told me you are studying in a college in Ohio. Then I lost connection with you. I would like to talk to you again. You can contact me by E-Mail.